yWorld is the collaborative networking platform designed for professionals. yWorld is the main focus of the development team at 2Dots Inc., based in Vancouver, British Columbia. We launched a wireframe Alpha test in August 2012, allowing us to secure significant private funding. Now, our team is proud to launch an entirely redesigned Beta test, packed with new tools for our enthusiastic community. yWorld did not have much visual identity for its product. Visual guideline is very important at the early stage of a startup because it helps set a visual guideline or goal for the whole team. Visual consistency will make both your team and users happy :) So, the first thing I did for yWorld was to design a user interface kit for the team. Second, Improvement on Dashboard feature. The dashboard did not expose the users to all the amazing features. It wasn't clear who replied to which post. The display of categories wasn't clear: the users needed to expand the nests of categories to find out about all of them. It wasn't consistent how posts looked: the two-column design did not work out, making it difficult for emphasizing hierarchy for posts that are the most bookmarked or the most recommended. A new sitemap that improves the flow. Categories are listed out so that it is easier for the users to navigate to different categories. 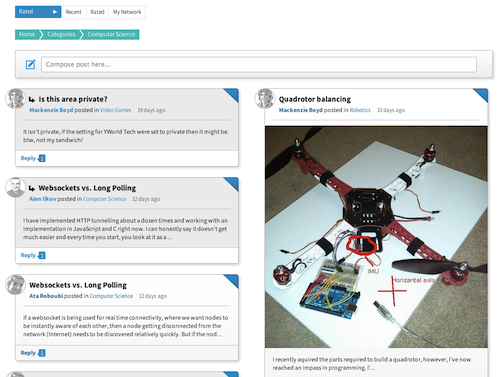 Post hierarchy is set by having a filter: recent, influential, following and bookmarked. Posts that are the most influential or bookmarked are featured as the post of the day. Then, there were UI improvements. For mobile, tablet and website views. In your profile, you can view, edit and delete your own groups. Below are mobile, tablet and web view of the feature. Users can exchange messages that allow them to privately collaborate. Below are multi-device views of the feature.